Have you ever stopped to look at your business through the eyes of your customer? What does your business say about you? Perhaps there is a need to change the space around you, or just jazz things up a little if it is looking a little tired? 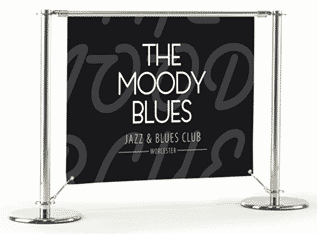 Café barriers can do this for you, with the added bonus of being able to further advertise your business or event with some eye catching graphics attached to the system. 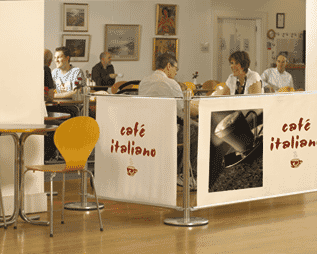 Have you ever considered how you could fully utilise a café barrier system? 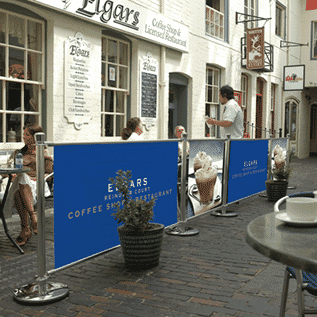 After all it is a product that can be used year round, however lots of people tend to think of a café barrier system as being a spring/summer product when that simply is not the case! Here are a few ideas of how a Café barrier system could benefit you, your business or event all year round. Canteens & Cafeterias could benefit from a barrier system to separate areas to dine, drink, rest and chat. Cafés, Bars & Clubs could also take advantage of the system to separate different areas indoors; offering seating areas or the bar area that is clearly defined. Gyms, Health Spas and Sports Centres all have specific defined areas, dependent upon what services are being offered. Many times they are open plan so a café barriers system would be a fantastic way to section the different areas whilst also advertising on the product itself. Museums and Libraries often have areas where queuing is necessary, either to view products on display or to loan books or other products. 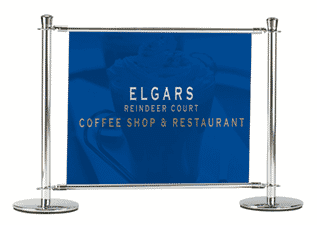 Café barriers would be versatile to use as not only would this make space more defined, they can also be used as a way to protect displays and products whilst still allowing people to admire the exhibitions. Checkouts at retail outlets often need some sort of queue management, more and more businesses are now utilising the use of café barriers; as there are further options to hang products in a basket from the café barriers for impulse buys, or even to advertise the latest products in store. Airports need to clearly define areas to the public for many different reasons, anything from booking in, to eating in one of the cafes or bars. The Café barrier range would be ideal for any of these purposes. Mobile indoor pop up shops are becoming more and more popular in shopping centres up and down the country. Many concession stands are now wanting to add that extra wow factor with their displays, and are utilising again the versatility of the café barrier to define spaces such as queue area or till area. 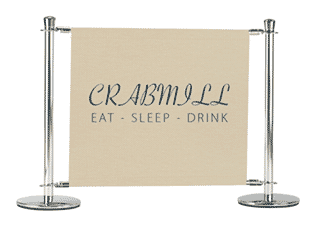 Stalls and Markets that are a permanent fixture could benefit greatly from a café barrier system, it could perhaps be placed around their stall to define their area, and also as a way to protect their goods that they are advertising, but also can be used to advertise and attract further custom. Sporting Events are another fantastic area where Café barriers would be ideal. Allowing areas to be separated for example, rest areas for athletes, pop up tents for eating/drinking, whilst advertising at the same time with graphics to further generate business and sales. Exhibiting not just your own business, but also sponsorship businesses also. Cafes & Bars to clearly define outdoor eating, drinking and seating areas. Perhaps setting the layout into different sections in a landscaped setting or even just to define your outdoor area from the public pavements when people are seated outside of your premises. Mobile or Pop up Shops are also starting to utilise their space more efficiently, and are doing so by using café barriers to provide specific areas for their customers, for example a food and drinks van may wish to offer their customers a seating area, where a café barrier system would be ideal for this undertaking. Plex understand the need to offer good quality products. It can be difficult to know which system would be best for your needs, so to make it even easier for you we have some helpful tips to share with you. Where is the kit being used? 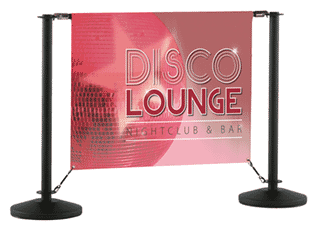 Indoors, outdoors, sheltered areas, exposed areas or high traffic areas? 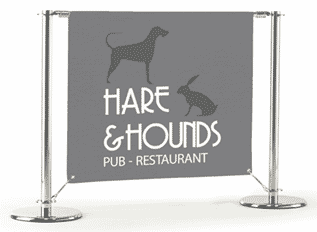 Certain café barrier kits are more suited to specific areas; for example, exposed or high traffic areas would require the heavier 18kg post and base, whereas sheltered outdoor locations would need a minimum weight of 10kg. Any outdoor areas can be affected by gusting winds so it is recommended that a suitable wind permeable banner is used where necessary. Is an Equality Act (formerly DDA) friendly café barrier kit required? If so, the Primo kit with its wheelchair friendly bases and lower cross arm is ideal. The shallow post bases allow the wheels of the wheelchair to easily roll over them, and the lower cross arm acts as a tapping rail for the visually impaired. 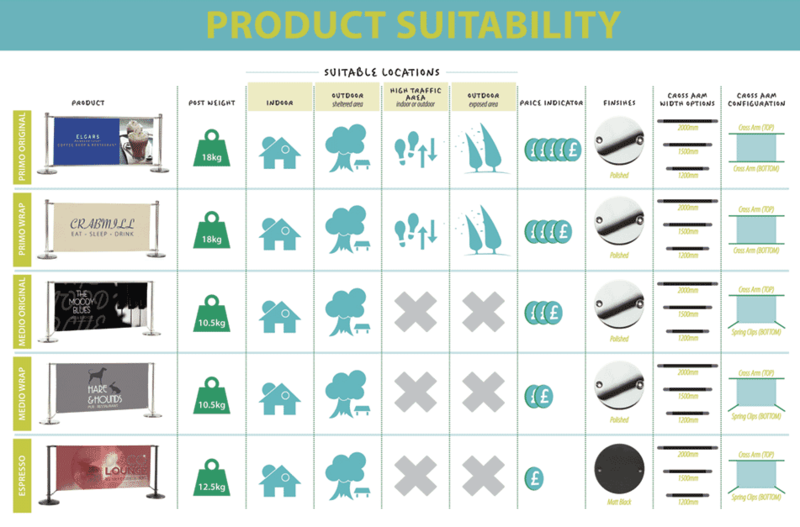 As you can see there are lots of options to use a café barrier system, however if you are still unsure or have questions, please contact our sales team where we will be more than happy to help and talk you through the process.